Oil prices traded slightly higher yesterday recovering some of the early week losses. However, prices could not hold on to their upward momentum this morning and are trading sharply lower following the announcement of China’s initiative to strike back on recent U.S. tariffs. Crude is down 93 cents (1.46%) this morning and currently trading at $62.58. Fuel prices are tracking crude lower this morning after the API reported larger than expected build for products. Diesel is down 2.75 cents (1.38%) and is currently trading at $1.9675. Gasoline lost 1.62 cents (.82%) to trade at $1.9579 this morning. Yesterday’s API report showed mixed results for crude and products. The report estimated that crude drew by 3.3mmbbls, while products built by 3.3mmbbls combined, leaving the overall inventory level unchanged. The report also showed a build of 4.1 mmbbls for Cushing stocks, higher than the market expectation of 3.6mmbbls. 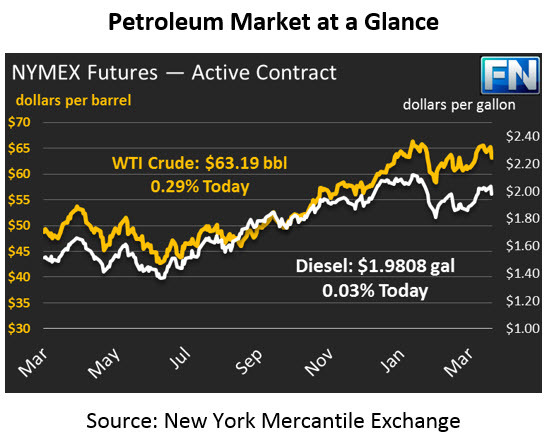 Crude prices were mostly unchanged following yesterday’s API report. Tuesday afternoon, the Trump Administration released a preliminary list of 1,300 Chinese products to be subject to a 25% tariff. The list includes $50 billion worth of imports, mostly focused on high-tech items. These tariffs are separate from those on aluminum and steel. The 58-page document accuses China of cyber theft and unfair trade terms with the U.S. Early Wednesday morning, China retaliated by publishing a list of 106 key U.S. imports that would be imposed with an additional 25% tariff. The value of the additional trade tariffs are equivalent to the $50 billion targeted on the list from Washington. China’s list is heavily focused on signature agricultural exports. Many experts fear these tariffs could really hurt U.S. agricultural. The announcement triggered a global sell-off in the financial markets, with U.S. equities losing 1.5% and the dollar also experiencing losses. What does this have to do with oil prices? If these suggested tariffs are imposed on U.S. imports, the demand for fuel will inevitably decrease as there will be less product transported from the U.S. to China. The anticipated decrease in demand is sending oil prices lower this morning.